Why does she bug me SO much? Let me back up, the day started out like any other Wednesday. Babygirl woke up nice and late today - 8am - life is good! Then, after making our way to the office - a little tough today because the traffic was bad (think homeboy and little dude running around fighting creating mass congestion on stairs and in hallway). Then to top it off, there was even a detour in the hallway (that's for you tpd), but regardless we make it to the office on time thank goodness! The usual breakfast for both - 8 ounces of pure heavenly Similac for Babygirl and 44 ounces of pure heavenly Diet Coke for me. Everything was going great. We did our "rounds"; this is when we check in on sales, internet traffic from yesterday, check email, etc... the morning "rounds". Everything still going great after rounds - 2 fresh sales, good traffic numbers, even google organic was up... then it happened. You see, the today show is also a staple of our morning as we have it on in the background from the moment we get in. Usually this is an okay thing, but inevitably, at least once a day, I will get annoyed with Ann to the point of wanting to clench my fists , shake my head in dismay, and scream at her through the tv as if I will actually get her to change her behavior. Today what set me off was when Ann was running around like a nut job hugging and being her usual dorky self to two today show staffers that were retiring. Does she think she is that cool? She is NOT that cool. Okay, I will not go into all the ways that Ann Curry makes my blood boil. She is seemingly a very nice person and I do not want to attack her personally, I will just say that I do not like her on camera persona. Allirght now that I've gotten this out maybe I can start the healing process. Admitting you have a problem is the first step, right? No lie, as I was wrapping up this post, Ann was wrapping up a segment on good posture for working out and keeping you back straight. So she says to the guy that was doing the segment, verbatim: "Thank you so much for helping us out with our backs, you certainly have one." Well, thanks for that observation Ann, yes. he does certainly have a back just like all of us have backs.... Perhaps I need to go to therapy and adress my issues with Ann Curry and stupid weather people. Is it just me or do I look kinda good with Matt Lauer...? I've definitely become one of those moms. "Oh my gosh, she is beautiful"
I've said these exact comments to other mom's of new babies time and time again. Sometimes fully believing them and other times, I have to be honest here, not completely 100% behind those statements. I know this will sound terrible, but before I had a baby I was always looking at the actual physical attributes of the baby, right or wrong, I didn't know any better.. I wasn't around babies a lot and I've never been a huge "baby person" so I couldn't understand how every baby was "so beautiful" or "so adorable". But, now that I am around one day in day out and I get to see the toothless smiles, the oohs and aahs, the most adorable soft sigh I've ever heard in my whole life, and the hundreds of other adorable baby noises and faces, all objectivity has gone out the window. I don't think you have to be a mom to "get it". I just never did, it took becoming a mom and being around a baby more for me to fully understand. So, now I see how anyone who's had a baby, been around them a lot or just really loves babies in general, can truly 100% say and believe that every baby they meet is the most adorable and beautiful baby.... because, in fact, they are in their own individual way. And, since I am now in that club, here's your daily Babygirl fix, whether you want it or not. Seriously, does it get much cuter? We're glad you're here! 8lbs 1 ounce 8:28 (i think) pm. Congrats Jeremy and Erin! She is so beautiful! Bridget can't wait to meet her new pal! Now, there is nothing strange about needing those things, what is strange is that the third item, the pony and the bear, needs to be placed exactly on either side of her head. They have to create a little barricade around her head like when you ride a roller coaster and you have those head support thingys. The bear is usually much closer, but she must have shoved it away when I took this picture. She will actually turn her head into them when she is trying to fall asleep. Back and forth rotating between the two babies on either side trying to decide which she likes better. Books...rocking...we don't need any of those normal baby things - just stuffed animals jammed right up against her head... we are definitely poster parents for what NOT to do in your crib. On most nights, I will stand there watching her as she goes to sleep. Her little baby head jostling back and forth between the two babies and watching the monkey on the rainforest soother rock on his vine... eyes getting heavier and heavier with each round trip...it is just so flipping adorable. Well, the whole reason I thought of posting this (other than the fact that I just watched this sleep dance take place) is that, as I placed the pony on her head tonight and she reached up and immediately jammed it into her mouth, I thought about our friends, Erin and Jeremy. In fact, many times when I put her to sleep I think about them. 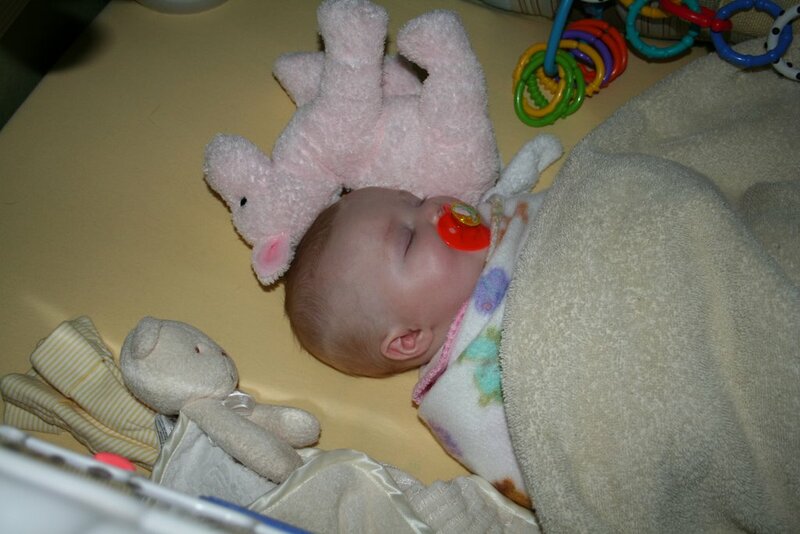 You see, they are the ones that gave her the all-important sleep pony and, for some reason, she has latched onto it to the point where I panic a bit if I don't have the pony. I can't wait to hear about her full head of hair or how she looks like Jeremy - sorry Hutch, but baby girls always look like their daddies! We love you guys and are so excited for you to embark on all those strange (and completely awesome) things that little girls bring! I'm sure you've all been dying for me to create another blog...well, the time has finally come. This one will actually be pretty boring for most people, but it will help us to continue to grow our other little baby, not bridget, but Bridget's favorite baby, Zoey. This is not the right place to be posting this, but I'm having major problems getting my new blog set up for Hip Clips/Zoey's Attic. Either way, I thought since tonight is a new office, we should pay tribute to it with a new design courtesy of Mark Jones. Here is his spin on tv's hottest new couple, Dwangela! I think he's on to something here. ps. Happy last day in your 20's Kim! We can't wait to welcome you to Club 30 tomorrow. It's a great place to be, really! hilarious and that others needed to see the super sad face, too. Enjoy! Cute penguin shirt from Cousin Amy! We love it! I so get it... I so get why parents say childhood is such a magical time. It's such a short window of time, you just wish you could bottle it and open it anytime you need a dash of magic. I guess that's why parents go crazy taking pictures, recording videos and even tape recording as often as possible - to try and hold on to it forever. 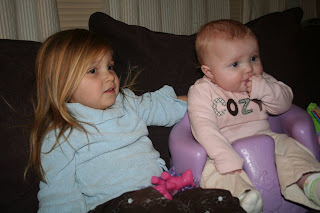 The blog title today came from "Miss O", our friends Steph and Jay's 3 year old daughter, Olivia. We were talking about ponies (thanks to Tommy's lovely little addition to our hallway wall) and she was explaining to me that she had a pony, too. When I asked her what his name was, she very seriously replied, "His name is Ponies, but sometimes I just call him Pony". It was just one of those classic moments and I'll never forget how adorable she looked as she told me about "Ponies". Here's a pic of Olivia with babygirl today. She was so cute and sweet with Bridget, she kept taking toys over to her that she thought she would like. At one point, Bridget was piled up with a stack of about 4 toys. See, now I wish I had a picture of that as it was hilarious... you just want to hold on to every thing and every moment. A new sound has recently filled our household. The sound itself is really almost indescribable. It's kind of like one of those natural wonders that you have to see or hear to believe. If I was forced to describe this sound, I would say it sounds most like a fight between a cat and a bullfrog with a soar throat. Most people would not like this sound, but since it comes from my one and only daughter, I must admit I find it to be a sign of an incredibly gifted child. The fact that she can produce so many inflections and tones from one little mouth is surely a sign of high intelligence, right? This sound can be heard morning, evening and sometimes in the middle of the night. It occurs without warning and is used to express a number of different emotions from happy, sad, excited to wicked mad. Talking on the phone with this new sound has become challenging as the sound is also not a quiet, cute, peaceful baby sound, but more like a sound that would be audible from the street, walking by our house, even if our windows were closed. Nonetheless, it is yet one more new fish in a whole sea of everyday new things and I love every one of them. Oh my, we do not recall a better hour of television in a very long time. Kudos to both Earl and our favorite show, the office, as they both put on a splendid display this evening. Awesome! And, if you love the office as much as us, you'll want to be sure and check out (shameless promotion) Zoey's Attic for great office apparel and gifts. Make sure to hurry before we get sued by NBC - they're sure to be collector's items after that! Well, aren't we all, really? Anyway, I am finally ready to post links to Zoey's Attic. My (not-so) secret project I've been working on for the last month and 1/2. We have been somewhat successful so far with this little business venture and we are excited to see where it might possibly take us. We are still a long way from declaring this a "business", but we'll see what happens as our knowledge grows and hopefully our business grows. After all, we started out small, right Big D? So, here it is, my labor of love, Zoey's Attic (appropriately named after Bridget's favorite Zebra, Zoey, since she is the inspiration and drive behind this initiative!) www.zoeysattic.com We still have plenty of work to do here, but we're coming along and welcome any and all suggestions and ideas! Well, that's all for tonight, I don't have much as I am still kind of in a funk about losing grandma and the funeral tomorrrow. I know all of this is good, it really is good, but you can't help think about time and loss and making sure to treasure what we have when we have it. I wish I could live in the moment more often, in fact, that was even my new year's resolution this year, so I am going to keep trying to absorb what is going on around me and delight in the little things of everyday life. I.E. not sweat any of the small stuff, it's not worth it and life is too short. Okay, enough of my pity party for the night. Prayers and love to my dad, aunt carol and uncle kent on the loss of their mom, cause I know if I am struggling with these emotions about my grandma, losing a parent, must be a whole new ballgame. It's just a regular monday so far (besides the raging cold that I am still fighting and unfortunately losing the battle against). Babygirl wakes up and contently talks to herself, Tim and I start rousing and I begin looking feverishly for my sudafed so I can breathe again when the phone rings.. "it might be your dad" Tim says as I try to become conscious enough to answer the phone and then I know, I know immediately why he is calling. I forgot to remember all of the sleepovers filled with games of ping-pong, chinese checkers and dummy rummy. I forgot that she would make sure I could sprinkle the powdered sugar on the brownies right after they came out of the oven since she knew it was my favorite thing to do. I forgot how she would cook Mark and I totinos pizza (with extra cheese on top - no wonder I love cheese so much) for a late night snack and let us watch Johnny Carson when we would spend the night. I forgot all of the trips to the farm and the smell and sounds of grandma up early cooking breakfast so that it would be hot and ready when we would crawl out of bed. I forgot how her homemade biscuits were the best, how she would take us apple picking in the fall, how fun bathtime was at her house and how the smell of baby powder can still take me back there. I forgot about playing the piano with her and how we would sing along to "Tootsie Wootsie" and "Let me call you sweetheart" as she showed me the right chords to play and when to use the pedals. I forgot how proud I was when my grandma would play bells in church. That was "my grandma" up there I would proudly proclaim. I forgot how she would call me her girl or gal depending on the day or situation. "We just made it, didn't we gal?" she would say as we went through a yellow light. And what about those special Christmas mornings when everyone would gather at Grandma and Grandpa's house to show off our new toys, eat brunch and better yet - open more presents! That was Christmas morning to me and I'm sure helped to define why I love the holidays so much. Yes, I'm sad, my grandma is no longer here in body with us, but I would be lying if I didn't say I feel some relief. Relief that she is no longer suffering or trapped in a body that won't let her bake brownies, play cards, or relive these very memories. I feel like maybe now I can regain a connection with my grandma instead of trying to force one with the person in the nursing home. She lived a great life and finally now, in death, hopefully has that life back; back to be with her husband, to remember her two sons and daughter, remember time spent with her eight grandchildren and nine great-grandchildren. I can only hope that at this very moment my grandma is once again with the love of her life, my grandpa, and that they are listing to and maybe even dancing to some Glen Miller, drinking a highball and playing a game of gin rummy with grandma and grandpa Beinart. I love you both and I will miss you until we meet again. I have finally posted all pics up to date, well, except New Year's Eve - but I think I might have to censor some of those since they all are most definitely not PG-13. If you head on over to my shutterfly account, here is the address delanty.shutterfly.com, you will find all kinds of good stuff going back to Liggy's Graduation, then Christmas baby photo shoot, Mom D's 60th birthday (with commentary), and finally the grand daddy of all albums, Bridget's first Christmas. She actually wrote the captions for that one, since she thought she could best recap her first whirlwind holiday season. Okay, here is a challenge to all my blog readers who take pictures, yes that means you: Kim, Aimee, Mom and Dad D (I think that might be all 4 of my total readership) but I want you all to post any old pics that you haven't posted. Kudos to the Jones' for already posting NYE pics, but I need pics from the Christmas celebration at my mom and dad's house (remember I forgot my camera and I think Mom D took a bunch), Thanksgiving in George from Kim cause I think you had some cute one that I wanted, and Aimee you are pretty up-to-date, but I'd like to see NYE from you, too! On a side note, Babygirl went to the Dr. today and got 4 shots. She handled herself like a pro - not even a tear, but now is a different story. Poor baby has been very upset since about 4:30. We gave her some Children's Advil and it seems to be helping now, but she was very warm and I could tell she just didn't feel right. Now I get it why it's so hard to see your kids sick. You want to take it away or do something and you really can't. It stinks, but we all go through it, so we are just trying to keep her comfortable. She's taking a little snooze now, but man did we have a full-blown meltdown earlier. She wouldn't even take her bottle so you know something doesn't feel good! So sad! Good things at the Doc were everything else is great and she is in the 96th percentile for both height and weight so even though she is big, everything is in proportion, so that's all that really matters. She is definitely teething Betty said, but she may still not get a tooth for a couple of weeks or a month, but no question about it she said. Lastly, I have to thank my sister-in-law Kim for providing me with both lunch and dinner for the past four days. I have pretty much survived solely on chicken enchiladas. You would think one would get sick of the same food over and over, but I promise you I am actually sitting here right now thinking about making my plate of enchiladas and watching the office and I couldn't be happier. So, thank you for making GREAT enchiladas and for leaving them behind when they would have been good leftovers for you guys, too! Happy "new office" night everyone! Well, officially another year, 2006, has come into my life and out. I thought I would recap (without Ehlert or TPD) about some of the great, not so great and other things that made up this past year as it was arguably one of the biggest years of my life. Here goes... 2006 started off with a bang and a gag. Shortly after learning we were expecting our first, we threw a New Year's Eve party. I was still keeping the pregnancy a secret except from close friends and family so I had to do a little fake drinking at the party. It was a good time and we had fun ringing in 2006 although it was different being newly pregnant and missing having Mike and Aimee to share the news and hang out with (they were in Cabo still celebrating the holidays with family). Shortly after the new year began, I began my pregnancy "renegade gagging", as I believe Aimee Muldrow called it. It would last well into March and really was not fun. I've always been a "gagger" not being able to control it when there are assorted bodily functions or terrible smells from my animals, but this would be a whole new type of gagging. An uncontrolable, out of nowhere type of gagging that was set off by seemingly nothing at times. My favorite gagging incident came one day while teaching an Excel class at UMSL. I was talking about how to hold down the control key to select "non-contiguous groups of cells" and immediately after those words came out the gagging began, in front of a full class of about 24 students, I struggled to reel it in and finally excused myself for a little water and gagging privacy. That was my favorite gagging moment of 2006. Other than that, early 2006 memories include telling family and friends about our impending addition to the family (I did not particularly care for spreading this news, but it was a big part of early '06 as we got further into the pregnancy). We had our annual traditional events like the Cat's Meow washer's tournament and Mardi Gras which were fun, albeit I couldn't partake in my usual celebrations of Anheuser Busch products, but I tested the waters with Non-Alcoholic brew and borrowed plenty of "sips" of the real stuff. The first big event of the year was Tim taking a new job. It unfortunately meant a lot of travel and a lot of nights by myself, but it was an important step for him in his career and it came at a time in my pregnancy when the gagging had settled down and I was finally starting to feel like a normal person again, at least for a couple months... The job started in March and between March and late June he would be gone off and on for 14 weeks. We made it and with the help of friends, family and Libby being my roommate for 6 weeks, I came out with three new decorated rooms (bathroom, my office and the guestroom) and a better appreciation for having my husband around! March was a busy wedding month with Chris and Kristi exchanging vows one weekend and Dave and Lisa the next. We had a great time at both events and although this was during Tim's traveling time, he surprised me by flying in for Lisa's wedding and I was so happy! I also realized during this month I am a terrible wedding present buyer... they are still coming guys I promise... you have a year right? I still have a couple of months. So sorry. April was another huge month as we welcomed a new member into our close circle of friends, Matthew Muldrow made his debut on my birthday, April 11th (something I had predicted from the day I heard they were pregnant). He immediately wormed his way into our hearts upon visiting him when he was only 6.5 hours old and he has been there ever since. We spent most of the better half of April and May getting to know this new little man and spending time hanging out with the new parents and addition to our group. It was great practice for us and I was so glad to have invaluable Aimee and Michael new parent advice as we continued to prepare for our big change. Also in April, Sheryl and Ronnie got married and we had a great time being a part of all the wedding events. Once again, being 5 months pregnant in a dress that didn't fit particularly well and having not even one glass of champagne before giving a speech to 200 people at a reception was a little trying, but a rite of passage for any pregnant woman and I made it relatively unscathed. The summer brought all kinds of fun stuff - from having Tim back home full-time to baby prep, it was a whirlwind! I had my first shower on a Friday night and it was a taco salad shower. That happened about the same time I started my blog, so if you go back in time on the blog, you can read all about the shower. July was a big month for Dad D as he turned the big 6-0. We had a great time celebrating the big event with a limo and full day of fun around St. Louis. July also brought a major storm which stranded many people without power and we had the Muldrows and Libby stay with us for about 4 or 5 days. It was actually a lot of fun and we really enjoyed the company, even though we joked about them never leaving... we really like it when we have a full house! The other big event was my shower thrown by Kim and Aimee. Again, you can read about that in a previous post. It was so much fun and I will never forget how much work they did and how exciting it was to know the time was drawing near. Then, finally on August 26th, Miss Bridget entered the world and everything was SOOOO... much better. It was over and the world as I knew it did not come screeching to a halt. She was beautiful and I actually LOVED being in the hospital. The drugs, the food, the nurses, the full night's sleep... I didn't even want to leave. Again, as not to bog this down with a recount of everything, you can read about Bridget's arrival in this post. I can't say I was immediately overcome with love and emotion for this new little being (sounds harsh, but I didn't know her and she didn't me, and we needed to get to know each other a little). Before long, though, she too wormed her way into our hearts and by the time we left the hospital, I was smitten and ready to see what each new day would bring. September was filled with adjusting to life with a screaming baby (they really get you by being all quiet and sleepy in the hospital and then you go home and BOOM... totally different story...). We had to work on figuring out what was wrong and went through many days and nights of crying spells (both her and me), but again we made it and will be better parents in the future because of it! It's so funny because I can remember EVERYONE under the sun telling me from day one home from the hospital when things were definitely NOT easy, that, "It just gets better and better...everyday is easier". I couldn't hear it at the time (I probably didn't want to hear it at the time), but they were so 100% right. Every week was usually better than the last and at some point, not too long after, it doesn't even seem hard anymore, it just seems "normal". I can't thank everyone enough. You all helped us out during our, a-hem, "adjustment period" and were all so helpful and supportive in both giving us space and being there when we needed help. I personally especially thank my Mom and Dad, who, besides Tim, I leaned on tremendously during the difficult periods and especially for all the times you said, "it will get better", you were right, it did and I couldn't have done it without all your help. It's funny, not until I had my own baby and became a parent and had to struggle with something so much bigger than myself (not in size, mind you...) did I realize how much I still needed my mommy and daddy! Life continued to become a "new normal" in October as we started to understand her better and she got used to her new surroundings more. We were able to sneak away a couple of weekends for some Tim and Erin time and went to Mizzou Homecoming and Octoberfest. They were much welcomed time for just the two of us. November brought our first road trip to Georgia and was again that much easier of a month. We definitely fell into being a family and developed routines, schedules, real life! Tim and I found time to play ping-pong again and this month was a breeze - if not, dare I say, great! December just wrapped up and was by far the easiest and best "new family" month of the year! We celebrated Mom D's 60th with an awesome night and surprise visit from Molly. (Will post pics soon, I promise!) Not to mention, Babygirl's first Christmas was so exciting, again.. more details coming soon. We did receive some really sad news in December, at the very least it has brought our family back closer together and I remain incredibly hopeful that we will continue to gain strength and that we will beat this and things will work out okay. Please, again, keep us and my extended family in your prayers as there isn't a day that goes by that I don't say a prayer for them and wish them continued strength and healing. Finally, things are gelling nicely at Ivy Trace and the 5 of us are really settling into our new life. We are excited to see what 2007 brings as we can't believe we'll have first teeth, words, walking, etc. Honestly, I am very excited for this year, for all the usual stuff that we look forward to each year, but also for the new things. The uncertainty of having baby is over and I now realize that uncertainty and change is actually good thing, it leads to all kinds of possibilities and a larger capacity to love than you ever thought possible. So, maybe that's how you measure a year... seasons of love (thanks RENT). I get it now and I can't wait for each new day. Treasure them all, each one. HAPPY NEW YEAR to all and thanks again for all the support and love this year and thanks for actually being interested in our lives enough to read this entire post...if anyone actually does! Let's celebrate - remember a year in the life of friends. Remember the love! Remember the love! Remember the love! Measure in love. Seasons of love! Seasons of love.